Safely Light Up Your Holidays! With the holiday season in full swing, many of us are rushing to get the final touches ready. Holiday lights are beautiful and much safer than candles, but all that electricity can cause problems if not used properly. Holiday lights can get hot enough to burn or ignite other decorations. The cords can fray, leading to a short. Decorating with lights often requires the use of a ladder, and improper use could lead to an injury. Make sure you practice proper ladder safety when you are putting up any holiday lights this season. Make sure when you pull out your lights for the year you take the time to inspect each set of – old or new – for damage. Return or throw out any set with cracked or broken sockets, frayed or bare wires, or loose connections. You will always need to replace burned out bulbs promptly with bulbs of the same wattage. Want to put your holiday lights outdoors? Use outdoor holiday lights. The packaging will note whether the lights can be used indoors, outdoors, or both. 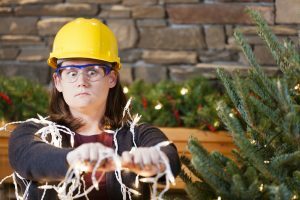 All outdoor electrical decorations should be plugged into a ground-fault circuit interrupter (GFCI). You can buy portable units for outdoor use, or you can have them permanently installed by an electrician. Stay away from power lines or feeder lines (these go from the pole to the house) and make sure to secure outside lights with insulated holders (never use tacks or nails) or run strings of lights through hooks. Choose holiday lights that have been tested and deemed safe by a reputable testing laboratory, the best are UL or ETL. Lights listed as safe by these laboratories will note that on the packaging. Try to use the cooler-burning “mini” lights as opposed to the traditional larger bulbs. The older style burns much hotter. Only use holiday lights that have fuses in the plugs. Never put more than 3 strings of lights together! Overloading your electrical outlets can lead to a fire. Never hang holiday lights on a metal tree. The tree can become charged with electricity and shock someone or it could short out the lights and cause a fire. When you leave or go to bed at night, turn off all of your holiday lights. Never pull on a string of holiday lights, it stresses the cords and can lead to fraying. Store holiday lights loosely wrapped so it will minimize the risk of fraying.